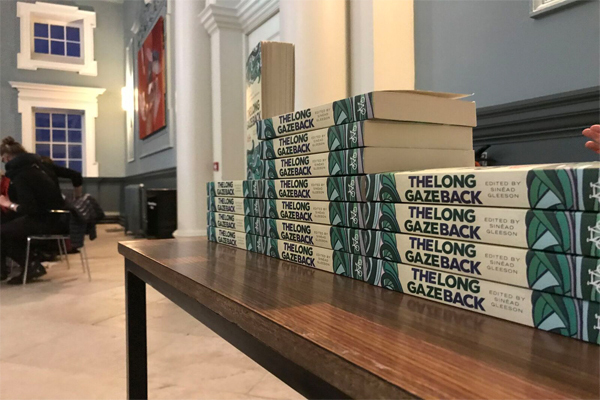 On Thursday 5 April the School of English welcomed more than 100 guests for ‘Enduring Fictions: Celebrating The Long Gaze Back’, an event for the Dublin: One City One Book 2018 season. Trinity hosts an event every year for One City One Book, and the School is always proud to contribute to this citywide celebration of literature and reading. 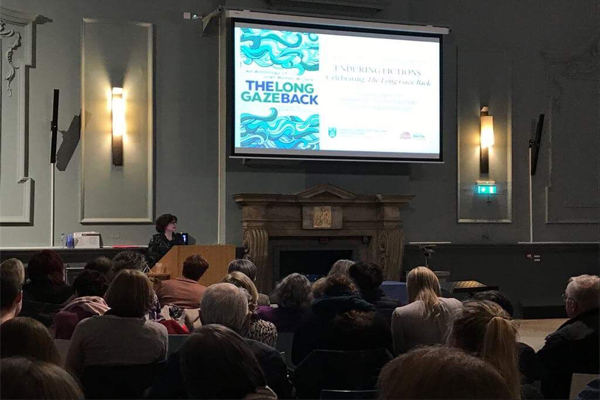 This year’s choice, The Long Gaze Back: An Anthology of Irish Women Writers, edited by Sinéad Gleeson, is a book of a many voices, so we thought it would be appropriate if our event was one of many voices, too. 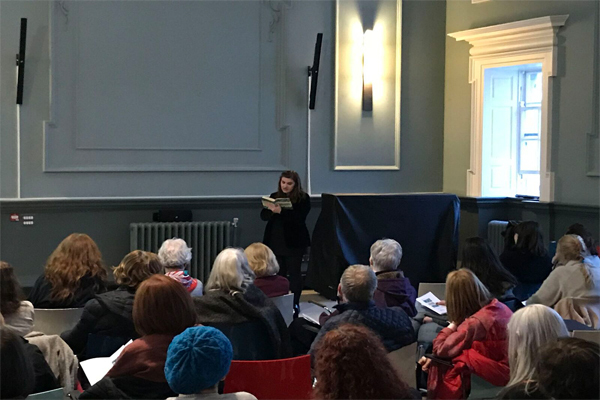 We welcomed seven contributors to Regent House, one of the finest Georgian venues in Trinity, to explore and respond to the stories gathered in the book, and the very timely themes they raise. 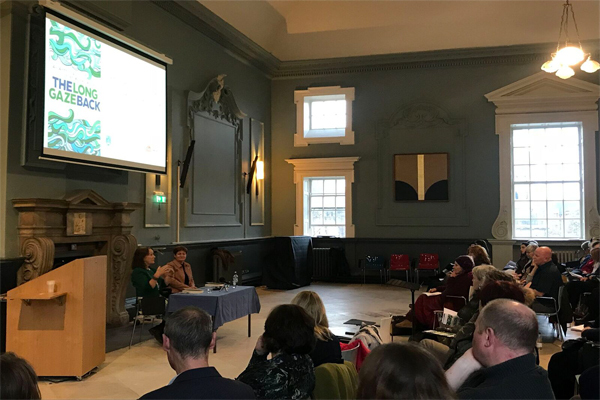 We began with a fascinating conversation between Éilís Ní Dhuibhne and Aileen Douglas, head of the School of English. Éilís Ní Dhuibhne is one of Ireland’s leading contemporary writers in both Irish and English, and she discussed with Aileen the issues of gender, representation, and literary history which The Long Gaze Back invites us to consider, before reading from her story ‘The Coast of Wales’, which appears in the anthology. Other stories in the anthology – Maria Edgeworth’s ‘The Purple Jar’, Elizabeth Bowen’s ‘The Demon Lover’, and Mary Lavin’s ‘In the Middle of the Fields’ – were explored in authoritative contributions from Amy Prendergast, Eve Patten, and Paul Delaney. 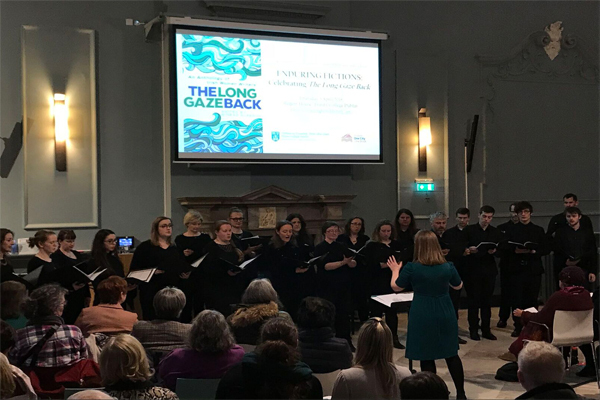 The stories were brought to life with evocative readings from Cliodhna Kelly, a final-year English and Drama student at Trinity, and the literary discussions were punctuated by music from the acclaimed Dublin choir the Mornington Singers who, under the direction of Orla Flanagan (Department of Music, TCD), performed four beautiful pieces, including two new works by women composers. 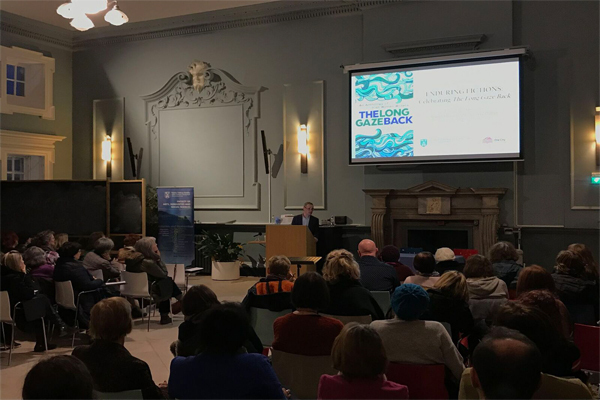 In this event we celebrated the diversity of women’s creativity in Ireland, from the eighteenth century to the present, using this inspired choice for Dublin: One City One Book as our lens. 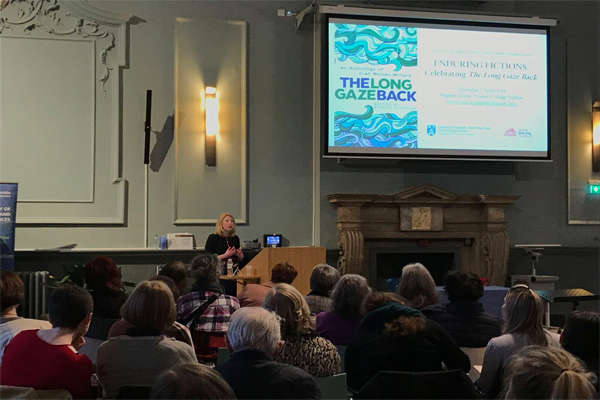 It was a great pleasure to welcome such distinguished and accomplished participants, and to share the scholarly expertise of colleagues from the School who work on Irish writing, women’s writing, and short fiction. Photographs by Francis Ittenbach and Theresa Murphy.